You’ll find Shanqin Bay in the south east of Hainan Island, close to the remote village of Bo’ao, and its fairways occupy a spectacular coastal site on which many thought a golf course could never be built, such is the extremely challenging nature of the topography. It’s said that a number of design companies declined the chance to work here before the developer acquired the services of Bill Coore and Ben Crenshaw and that assertion may well be correct because the difficult terrain would undoubtedly deter all but the bravest of architects. A wide variety of landforms are experienced during a round at Shanquin Bay – from cliffs and chasms to dunes and dense vegetation – as the generously proportioned fairways wind their way around the property. On the front nine, feature holes include the par four 5th, where the fairway is routed around an irrigation lake then over a ridge to a blind green and the short par thee 8th, played across a gully to a greensite set into a sand dune. The back nine certainly has its fair share of highlights, including the par threes at 11 and 14, but the holes that really steal the show are the closing set of par fours, beginning at the cliffside 15th – with its wonderful South China Sea vistas – and ending with the testing 18th, where the shallow home green sits precariously on top of a ridge. In between these two striking holes, the sensational short 16th drops more than 50 feet from tee to green before the stunning, bunkerless 17th, which some are already calling the “signature hole”, then veers slightly right along the beach to a long, narrow green. Constructed in a manner unlike anything that’s been built before in China, the Shanqin Bay golf course just might become the benchmark for those still to come. But this is China, where the government rules the roost. In 2017 the authorities planted thousands of saplings along the "signature" 17th fairway in order to create a wind break. The club installed a temporary par three, but undeniably these bizarre actions have removed the gloss from a course that was perhaps destined to become Asia's No.1. Shanqin Bay is a true gem and one of the best courses in Asia. It’s a shame that more people don’t get to see it but being arguable the most private club in the world this is not really a surprise. Its exceedingly small and wealthy membership consists of less than 50 people from around Asia. What they receive for their annual fees is a spectacular Coore & Crenshaw routing on a very steep and undulated tip of a peninsula with Shanqin Bay on one side and the South China Sea on the other. It’s an amazing location for a golf course and Coore & Crenshaw hit a home run with the routing. An opportunity to play at Shanqin Bay is a bit like being a child invited to an exclusive day at Disneyland and having it all to yourself with all rides running and all the Disney characters being on hand for the party. I arrived at the resort to a warm welcome and round of applause from the staff, only to find the driving range ordained with a large Welcome David sign made of golf balls. The range, wonderfully designed and can actually double as a short course and does every month for the caddies to practice and have small competitions. There was not a single divot on the range…nor on the course. After a quick warm up, given not much warm up is needed when it’s 35 degrees C and sunny we were off to the first tee for the usual ceremony, photos and start of what would be a brilliant 36 hole day. The 1st hole is a shortish par 4 requiring a drive along the left side in order to have the best approach to the green which is slightly up hill and running diagonally from left to right away from the angle of approach. A drive down the right side (where I ended up) leaves a very tricky steep up hill approach over a rather menacing bunker. Did I mention left was the play off the tee? The greens are quite undulated and kept perfectly, running about 10 on my day which was plenty fast. The wind was blowing about 25 mph which made the temperature much more pleasant. The 2nd hole is a reachable par 5 with a blind tee shot. The best play in order to catch the speed slot is center to left center. A strong drive will catch the downslope and leave a long iron or fairway wood approach down the hill to an excellent green with the sea as the backdrop. On the right of this hole is an old wall built during World war 2 complete with engraving of Mao Zedong. The club has gone to great lengths to preserve this wall as well as the engraving. The 3rd hole is a tricky medium length par 3 that plays pretty severely down hill. On our day the wind was howling behind us so the trick was to land the ball short and let the slope take it down to the green in order to not risk running over the green and into trouble. The slope and green feeds to the left and the best shot on our day flirts with the large right side bunker. The 4th hole is a tricky par 4 that tempts you to cut off as much as you can chews, with trouble in the form of heaving shrubbery running down the right side at a left to right diagonal line to the tee box and a fairway bunkers along the left flank and shorter on the right, which into the wind served as pretty good targets. A solid drive left a 5 iron approach to a very tricky greens that slopes severely left to right. The days pin placement right on the edge, I was informed the superintendent must have been teasing me. My approach to 10 feet saw me touch my putt, lipping out gently then running down the hill onto the fringe. The par putt just missing to the right of the hole rolling behind the hole then past the hole again and back down off the green. We laughed probably because it was a better option than crying, knowing I would have lunch with the super we agreed to restrict his adult beverage intake for the rest of the day. I made the bogey putt. If not I might still be there. After the 4th hole I was naturally feeling tired….as you do after 4 holes on an amazing golf course, so luckily it was time to stop and eat a full meal. No kidding! The staff greeted us there with fresh coconuts just opened, chilled and complete with straws. Refreshing, along with various other local delicacies. Glad I hadn’t eaten a large breakfast. 20 minutes later we went out to tackle the 5th hole. The 5th hole, a medium length par 4 plays across part of a small lake to the base of a big dune with a large bunker on the right side of the hill face. A good drive leaves a blind approach up over the dune to a green just over and down from the top of the dune. The green is tricky and runs front to back and drops off severely on the back side, distance control is essential, the for forecaddie assists you by lining up your blind shot. The 6th hole is a long par 4 running back away from the sea with the lake on the left side all the way along the fairway and through the green. The design is set up so that the fairway on the right side slopes right to left enabling a pretty generous landing area even though visually you see something different from the tee. The green is long and relatively narrow allowing for a myriad of running shots or even bouncing it off the wall on the right hand side. Basically anything goes but left which results in fish food. After a bit of a climb up, the hill the 7th hole runs back towards the sea again. An elevated tee shot and left is the play if you want to avoid a blind long approach into a tricky green. A long tee shot hugging the left hand side rewards you with a view of the flag which plays off the top of a dune and pretty severely down hill to a green protected on the right side by a bunker. The left side has a slope running down to the green allowing for a bit of a bank shot in. It would take either a fantastic caddy or a few plays to try and gather all the intricacies of these holes. There are many options available. The par 3 8th hole is a brilliant short 1 shotter and my favorite hole on the course. It has one of the most amazing (and natural) green sites you could ever wish for. On top of that the hole runs diagonally towards the South China Sea and requires a wonderfully controlled tee shot in the wind to hit and hold this tricky green. Short ends you in a huge bunker as does long, left or right. The green has too many contours for me to successfully describe it though it has a false front and drops severally on the left back side as well. The 9th hole is a short par 4 playing significantly uphill to a raised green. The approach is really testing as the green is small and anything to the left is penalized with a deep bunker. Long runs away from the green. Short right is the safe miss leaving a puttable or easily chipable approach. The 10th is a long straight par 5. Many have suggested this to be the lesser of the 18 holes on the course. I would certainly point out that the lesser of 18 arguably great holes is still pretty darn good. The hole is straight and the flattest hole on the course but the drive is challenged with a centerline bunker and in most conditions you are facing a cross wind. Incidentally, the hole killed me on both plays so I can’t call it the easiest in my opinion in any case. I would suggest it requires 3 good shots in the wind to come out with a par or better. Something that can’t be said of all par 5’s. The 11th hole is the longest par 3 on the course at 251 yds from the tips. In most conditions this hole plays shorter than the distance. Slightly downhill to a punch bowl green. The movement of the fairway works like a reverse Redan making this a really fun hole to play for all levels. A shorter hitter can play a driver that has a good chance of feeding down to the right either on the green or to the front leaving a manageable putt or chip. It’s the kind of long par 3 that really plays to the advantage of a higher handicap player or lady with a low running ball flight. The 12th is a medium length par 4 playing back towards the ocean along a ridge. The play off the tee is hugging the right hand side but this requires challenging the huge centerline bunker and the certainty of a lost ball missing right. There is plenty of space on the left but with the fairway tilting further left, the resulting approach shot is extremely difficult, sharply uphill and over a tricky deep bunker to the left of the long narrow green. I should mention that this green is also set up to allow for a bank shot off the wall on the right hand side that feeds onto the green. This makes the seemingly very difficult shot from down below on the left side of the fairway really fair once you get to know the course. The reader will notice I’ve pointed out similar features on other holes, certainly I’ve also missed many in only two plays here but this really goes to the credit of Coore & Crenshaw and team as this course is incredibly playable for all levels even if it seems very intimidating to the eye. The 13th is arguably the strongest par 5 on the course. The drive to a fairway running diagonally away from the tee box to the right. Bunker short right and long left guide you to the ideal landing zone that has an excellent speed slot that will afford the best drives perhaps as much as a additional 50 yds. Into the strong cross wind I didn’t dare to aim far enough right to take advantage of this cool feature. Notable on this par 5 is the centerline bunker that threatens the second shot layup or the person going for the green in two. The approach is to a small raised and heavily undulated green sloping back to front. The afternoon pin position was back left and a serious challenge in getting the ball back there close. The par 3, 14th is a rare hole indeed. This 1 shotter plays straight and steeply uphill to a raised green with huge bunkers both left and right far below the surface of the green. The safe play is to the back half of the green which is shaped a bit like a pear. With front pin positions taking extreme accuracy with the risk of being in one of the huge bunkers. Playing long to the meat of the green will leave a challenging putt to middle and front pins. Once you reach the green you can see a nice view off to the left of a neighboring pineapple plantation. The closing stretch of holes must go down as one of the best and most unique in all of golf. The 15th is a par 4 that plays from an elevated tee to a fairway running diagonally left to right and downhill. A drive center to left affords the best angle of approach to this long and tricky green. Again there are some slight slopes on the left side of the green that can assist the player. Right all the way along this hole through the green is trouble, some bunkers and cliffs. The short drivable par 4 16th hole is extremely fun and a realistic birdy, even eagle chance for most players. At only 313 yds from the back tees it plays much shorter. There are also many ways to play the hole however it’s tough to resist the thrill of going for the green. There are deep and severe bunkers front right and front left center that can be very punishing. The green has a back plateau but slopes severely back to front. Getting an approach or a chip, or even a putt for that matter all the way back to a back pin placement can be a real challenge. A front left pin can be equally as challenging speaking from experience as on my first play I drove the green on the left side but was left with a long downhill putt to that front left position and couldn’t believe it when my putt skated past the hole just catching the slope onto the beach (bunker that is). What a place to putt into the bunker for the first time in my golfing life. The short par 4 17th has already become famous from the photos of this course. From high atop a cliff the breathtaking drive is all the way down to a fairway running along the beach diagonally from left to right away from the tee. Basically you take on as much of the beach as you can but be careful as the wind plays havoc with the ball from this height. A good drive leaves a short but really tricky approach to a fast front to back and left to right sloping green that appears to run straight into the ocean. A solid approach to the left side of the green feeds right. Finally the 18th holes is another short par 4 with a thrilling semi blind drive that visually plays havoc with your tee shot. There is an old brick wall lining the fairway (let’s call it a A Great Wall in China) on the left side and a huge undulation/hill that makes it look like you are aiming at an impossibly tight fairway that runs away from you, much in the way a cape hole would, daring you to cut off as much as you can chew. A strong drive will catch the steep downslope and leave a short very tricky steep uphill approach over a front center bunker to a narrow green with a bit of a backstop that is not visible. With a tail wind it’s possible to cut the entire corner and go for the green for long hitters. On the tee the drive is equally compelling for all levels. Shanqin Bay is truly a special place. It’s unfortunate that more people will not have the opportunity to see it as there are not that many golf courses out there which have been built at an extreme high level by one of the best design teams and built to be playable for everyone yet still manage to be thrilling, full of variation and built on an idea setting. It would also not be fair if I’m being thorough in my review to leave out the fact that their aim is to provide their members and guests the very best service in the world and they have without a doubt accomplished this. The wonderful team operates as a warm, efficient and sincere family unit. They take care of you from the moment you come in contact with them, right off the plane to the moment you depart. It’s truly unique and the best way I can describe it is like you are visiting your family (and they all get along wonderfully and work together towards a common goal). I travel extensively and Shanqin Bay provided the best service I’ve ever experienced. As far as the total package goes they are the top of the bar, the best of the best, the perfection which all other resorts and courses are striving to reach. 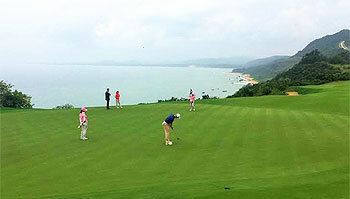 Shanqin Bay is the only golf course in China to be ranked in the Top 100 Golf Courses in the World by Golf Magazine. To say it’s a unique experience to play here is the greatest understatement in the history of this game… but not for obvious reasons. Firstly, it’s a million dollars to join the club and they have 22 members. Since it opened 3 years ago, the club has had 30 VIP guests that have visited the property. Golf at Shanqin Bay is not like any other club on planet earth. You have to get permission from the Club Chairman in Beijing to visit the property. You’re met at the airport by the General Manager, his assistant and then taken in a limo to the property. In the run up to your arrival, you’ll receive countless emails expressing how excited they are to have you visit. It’s clear that they want golf course raters to visit them, yet the due diligence to authorise your visit is immense. The security guard at the front gate knows your name, stands to attention with his hand to his forehead like you’re an admiral in the army and welcomes you to the club with the only English phrase he knows. It’s a nice touch, but so weird. Click the link to read Fergal’s full report on Shanqin Bay.